This morning on my way to work I came up on a head on car collision that had just happened seconds earlier. A young boy was thrown into the front seat in one car, air bags deployed on both cars. At first glance it appeared that one driver and the child may be dead. We could not open the doors and had to call 911 and wait. Fortunately the drivers and child started moving. When emergency rescuers arrived they were able to get the child out and it appears he will be okay. The drivers are alive but who knows if they have head trauma. You guys know about the UGA girls and the tragic accident there. While we don’t know, my suspicion is the drivers were distracted, and my guess is they were distracted by a cell phone. I am guilty. I let my phone distract me at times. I check a text or email. I look up a number to call someone, maybe calling you. These events remind me it’s not worth it. It happens in an instant. Please, please, please. Leave the phone in your pocket when you are driving. Look at the directions before you leave to go somewhere. Program the GPS before you leave. Do something radical and turn your phone off. Don’t tolerate your friends using their phone when driving. I love you all so much and don’t want a distraction to hurt your or someone else, to cause something like this. 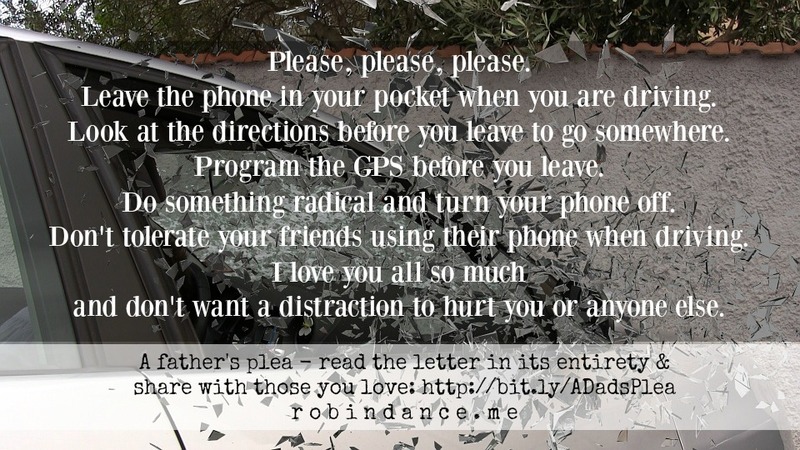 Please hear your Dad’s plea when that text message goes off while you are driving. A sweet friend lost her husband last month in a “distracted driving” accident. He was hit from behind as he was cycling with a group in a suburban part of Georgia. Tremendous loss, for his wife and the entire community. I’m embarrassed but I will admit that her loss is what finally made me put the phone down. I hope this plea will make others do the same. Thank you for posting this. It is so important for young people to realize that even a minor distraction can cause major life changes. I heard on the news earlier this year that a man in California was driving to a meeting about a device that will turn off cell phones in your car. Well sadly he never made the meeting because some young woman was to busy texting to see the red light and hit him head on killing him. Such needless tragedy that could have been prevented.